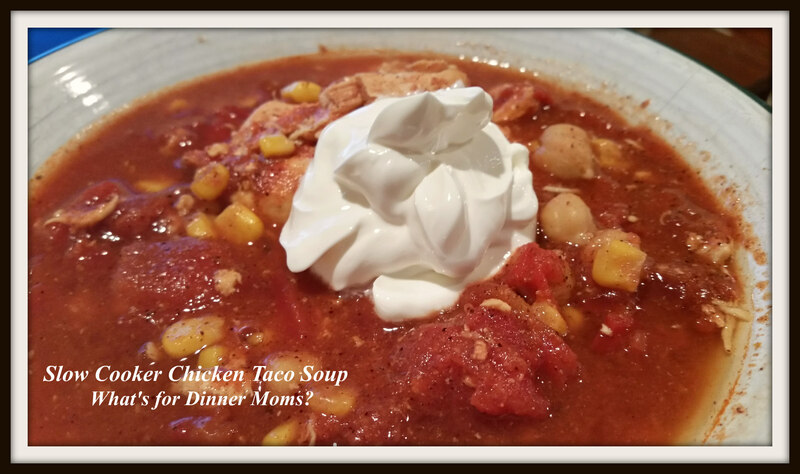 Slow Cooker Chicken Taco Soup – What's for Dinner Moms? So, dinner the other night was at 9:30 pm. Yes, really. The picture above isn’t pretty but this was my bowl of soup at 9:30 pm! My son had play rehearsal until 5:30 pm and needed to be at the high school for his orchestra concert at 6:00 pm. He ate a snack while I drove between the two sites. He ran in to get ready for the 7:00 pm concert. Normally I would run home but since my daughter was sick and not going to the concert I got an awesome parking space and made a bunch of phone calls and got some emails sent out. My office is often my car. The concert did not let out until after 9:00 pm. I think that is too late for 6th – 8th graders. My son still had math, science, and English for homework and to eat dinner. Thankfully I had started dinner about 3:00 pm and knew it was waiting at home in the slow cooker for us. A loaf of bread was in the bread maker too for us to have with our soup. Hot bread and warm soup? Perfect. It was such a relief to know that as we headed home that dinner was ready in the slow cooker. We weren’t trying to stop by one of the very crowded fast food places because everyone was headed to them! The soup was a bit spicy (cut back on the red pepper, Cayenne pepper and/or chili powder if you like things without so much heat) but for us it was what we needed. My daughter has been battling a head cold and the spice allowed her to breathe a bit while she was eating it. She said she could actually taste something! My son likes hot and spicy and could add a dash of hot sauce to the broth. I added sour cream to the top of mine to cool it down just a bit. You can add black beans, cheese, tortilla chips, sour cream, green onions, sliced onions, or peppers to the soup as you like. Remember to taste and make it your own! Place all ingredients in slow cooker. Stir well and cook on low 5-6 hours. 930? I would not have made it. Nothing like knowing that dinner is done when you get home. Best feeling in the world and saves money too. This looks scrumptious. Thank you! It made me feel really good as we drove past the crowded fast food places to know I had something I could feel good feeding my family waiting for us at home. Best part was it was super simple to put together before we left! I love hot and this sounds fantastic. We are in Autumn not so I am saving this recipe for our winter months ahead. Thank you! We are supposed to be in Spring but it is 25 degrees Farenheit today! Whew, glad you pulled all that off! It looks delicious. Thank you! It was nice to come home to a good meal. this looks like a dish we recently made…so good! Thank you. I found your site because you liked something on ours (our blog is very new), can’t wait to make this soup! Yeah! I just went and followed you.